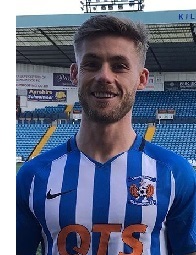 Jan 28th 2019: Kilie announced the signing of Conor McAleny on loan until the end of the season, subject to international clearance. The 26-year-old forward arrives at Rugby Park from English League One outfit Fleetwood Town and becomes our first signing of the January window. A product of Everton’s academy Conor made his English Premier League debut in December 2011, replacing Phil Neville in a 1-0 defeat to Arsenal at the Emirates. He appeared in a 1-1 draw with Norwich before loan moves to Scunthorpe, Brentford, Cardiff and Charlton. Successful spells with Wigan and Oxford followed before joining Fleetwood Town in the summer of 2017. Feb 6th 2019: Conor scores on his Killie Debut at Dens Park.